Sneak Peek: "Tech Talk" and "Lovely Shelf"
Here I made a card/Valentine for my husband, the greeting stamped onto the screen is one of many from the set. He, like most men, likes things really plain, so I used neutrals (Soft Sand base) and kept "his desk" very minimal. Isn't that fun making a quick scene with the mug and picture frame images?? I stamped the open frame over a photo of myself, trimmed it out and adhered over the center of stamped image as if I were paper piecing. Next, I have a card using Nina's new "Lovely Shelf", she is just an illustrator after my own heart with these elemental sets she designs! It has, of course, a shelf and lots and lots of other lovely things to pile on top. Today I stamped the shelf upside down, this way the brackets can look more like bookends or turn the shelf into a serving tray, so I added a teapot, cup and vase. Super sweet and simple! And how do you like that beautiful card base color?? It's the new Gina K Pure Luxury Ocean Mist and I am in heaven!!! It freshens up any color you pair it with, here I went with clean Black Onyx and White. The scalloped mat behind it looks great with the all the curvy details in these images. I added just a touch of color to my pot and cup for shading and vase of flowers with pastel Copics. I also added lots of flowers from the vase to the screen with the masking technique, I love all the possibilities this screen provides go crazy making your favorite "screen savers" with stamps, DP, postcards, whatever! So you don't have to drag out the Post Its every time, I recommend stamping the computer onto scratch paper and cutting out the screen. Now you can place this over your image stamped on CS and go to town adding whatever you like. Remove your mask and color as desired. Here is a simple card using "Arranged with Love" stamped in gray on one of the digital Summer Fabrics, a freebie from Gina K Designs, which I printed out on Pure Luxury White. Doesn't that look like real fabric? I love how stamping over this looks like a woven tapestry! This photo looks so dark I know, but the layer underneath is In the Navy to go with the pale blue flowers. Get well cards I often try to combine a mix of muted as well as more cheery colors to try and convey both "I'm sorry you're sick " and "things will turn around!". This card measures 4 1/4" square, I used a scalloped Nestabilitie under the image, which is also an example of how you can crop the larger flower frame from this set to adapt to your square cards. This is a two layer card, with the Festive Frame stamped in Memento Tuxedo Black on Pure Luxury White with a Rocket Red base. I used Copics Lionet Gold for the borders and Strong Red for the background. Let me tell you I loved coloring instead of cutting out an extra red layer and it doesn't add weight to my card! :) Oval was sponged with Antique Linen Distressing Ink and stamped using Nina's music border to go with the Christmas caroling title/greeting from the set, and to be honest I can't look at this card without wanting to burst into song! (come Dec 1, Christmas music will be playing in my house during every waking hour for the WHOLE month LOL! Last , gold edges white organdy ribbon provides the "necessary" holiday sparkle! Here is a card I made before the "Inspiration Mosaic" release but hadn't shared yet, realized we are about to get out of the "pumpkin months" for awhile, uh oh! LOL! This was a fun way to use the mosaic for an understated card: stamp your grid on colored or neutral CS (here Pumpkin Spice Pure Luxury), in any color ink, it won't matter because this will be the BACK. Now line up the different lines over your tracks on your Scor-Pal and score away until you have the entire frame scored, I did all the verticals at one time first, then turned the CS and finished the rest. Once done, I flipped it over and now you have this beautiful tone on tone dry embossed look! I mounted it on Ivory Pure Luxury. I inked up the "Tropical Window" with an olive and pumpkin marker and stamped, then trimmed it to pop up onto the grid. I wanted to recreate that same thin live border on my base as on the image, so I just drew one 1/8" in on all sides with my marker and a straight edge. Final Festive Week with Linda Payne! Ahh, it's been a festive month with Linda, hasn't it? We are one week away from our next Gina K release, and i have one more of Linda's "Festive Frame" projects to share with you! No"frame" today just this sentiment and some gorgeous poinsettias (from the matching "A Year of Flowers" set) and it's just a symphony of colors and patterns! Cranberry Tart, Good as Gold, White are all Gina K Pure Luxury and the SU! Purely Pomegranate thrown in ties in the fuchsia in this beautiful swirly Basic Grey Eva print. I am just lovin this two tone look of the poinsettia in deep these jewel tones! TIP: A printed ribbon could get too busy with another print, but these patterns and gold that ties them both together is really working here, a bold and artful choice, great job Linda! Finally the gold embossing and cut work really takes it over the top, plus details like the nail heads, cording and highlighting the words with a bit of yellow are just the cherries on top of this amazing card! Here is a silhouette card I made using Signs of Autumn and Thanks a Million. I stamped the rooster first in Vivid Coffee Bean and then stamped the wheat all over the bottom stamping off into the distance. The ones closest to the bottom I colored in with a dark Brown Copic to match my rooster since the wheat is a line art image. Leaving the ones behind it open, though, give it a little more variety, depth and texture. then I sponged olive ink on the bottom and rust ink to the top, adding a circle mat at the end and sponging a little more to make a sun (and give me a nice spot to put my greeting.) I placed a square nestabilitie over my mat and traced a square border to frame it up, then ran the marker along the outside edge to give it a double border. A few punched large flourishes from Chocolate Kiss Pure Luxury finish it off. Card base is Sweet Corn. I love how these images and colors evoke the quiet countryside! I made it months ago and had to share it while harvest time is still here! :) Have a happy Thanksgiving later this week! Here is one of my favorite cards fro this release, I just love the way the colors turned out and how the Good as Gold base just sets it off! "Festive Frame" as stamped in Memento Black on Pure Luxury White and colored with Copics, the the bird from "First Christmas" was cut out and popped up after coloring, the edge of the window makes the perfect little perch for him! A few adhesive nail heads to the top balanced out the layout. Punch it Up Tree #2! Here's another simple card (no stamping today!) you can make using one of the corners from the EK Success Curved Corner double punch. (be sure to see this post for a tree made with the other half of this punch!) Aren't those three points perfect for a layered fir tree?? I punched out 6 for this 4.25" square card, but you could make it taller to match the proportions of your design. Starting from the bottom, I put a little adhesive at the the top of the punch and lined up another one over it, repeating the punches and adhesive until I got to the top. I popped the completed tree up on to the die cut scalloped Pure Luxury white mat, then added some little adhesive strips of 3 mm pearls for garland and a little shiny red button from the Gina K Holiday button assortment at the top with a glue dot. Card base is All Spruced Up. This paper pieced mosaic uses some of my favorite prints from one of my all-time favorite Basic Grey packs: "Ambrosia", how sweet it is! The easiest way I've found to piece the grid is keep one DP grid whole as a base for the smaller top pieces, here the pale orange and grey print is all one, with 2 - 3 smaller pieces each of the dark gray and dark orange prints adhered on top. I matted the peiced grid onto Pure Luxury Black Onyx and Moonlit Fog, then added some punched curved corners and a monogrammed pieced(stamped with a Just Rite letter over the grid. Last I embellished it nailheads (colored witha black Copic) and ivory sateen flowers. I love the combination of sets on this card: my "Festive Frame" and "Hand in Hand", and "Vintage Borders" by Nina Brackett. After stamping the frame in Memento Black onto Ivory Pure Luxury, I colored the images and borders with Copics (trimming the image leaving about 1/8" around, lining the edge with black and coloring with red to make the double border) and then masking the center oval and stamping the greetings border (love all the languages in this one!) across in Antique Linen Distressing ink, I love that soft look on ivory. Next I stamped the pair of hands in the middle, colored and then sponged more Antique Linen ink into the oval around them. Last I inked up just the "a child is born", part of the Bible verse from the Festive Frame set and stamped at the bottom right. I wrapped a Large Flourish punched from Fresh Asparagus to the top accented with a few adhesive pearls I colored with my Cardinal Copic to look like the berries in the arrangements. Here is another bleached card I made with "A Year of Leaves". I embossed the leaves in gold onto Pure Luxury Green Apple, the addition of bleach to the center turned the paper a beautiful sunflower yellow. I cut the paper into sections and matted them onto Ivory and a Good as Gold 4 1/4" square base. TIP: Dividing up a patterned paper into panels is a great way to add interest to your layout without covering up the print or makigna more ccomplicated layout than you have to! :) The greeting uses a large and small oval punch, popped up, and accented with adhesive nailheads. Ribbon is ivory gold lined organdy. Have a terrific day, we have so much to be thankful for! Welcome to this stop on the "Vintage Borders" hop! Today I thought I'd share holiday projects that would be very simple to mass produce using just a few layers, and no coloring. This first card is 5 inches square. I die cut a square out of the middle of my White Pure Luxury mat and then stamped this border around the edges, using the window as guide. I added some adhesive pearls to the corners and middle of the medallions. Mat is raised up on pop dots on the Rocket Red base. If you leave a space in the middle of the top of the mat, you can slide a photo in and out, the pop dot in the middle on the bottom edge of the mat will hold it in place. This next card shows a fun way to ink up just one greeting you want to emphasize from this many language border with your markers. Scalloped border is stamped below is Vivid Brick. Since the set has no focal images, I thought I'd create one to go with the holiday borders: this wreath from Petite Scalloped Nestabilities dies and accented with some adhesive pearls and colored nail heads. Organdy ribbon was tied with the Bow Easy. Easy peasy! How about some more inspiration with the Vintage Borders stamp set? First, check in with the Illustrator of this versatile stamp set, our Senior Designer Nina Bracket and her friend Lisa Hjulberg joining in the blog hop tonight. Before you finish hopping, be sure to check in on GinaK's blog to enter your comment for a chance to win Nina's Vintage Borders stamp set. If you already have purchased Nina's set, you can substitute any GinaK Designs stamp set valued at $23.95 or less. For those of you are who looking for a quick and easy Christmas card idea, check out the Vintage Borders Card Kit available online in GinaK's store tonight. The Kit includes the step by step tutorial as well as all the card stock cut to the exact measurements needed to make 4 cards. For more details and photos of this card kit, see Jessica Fick's blog link as well as this Class Kit link. Thank you again for visiting me today! Eek! I am so excited how this clock project turned out! First color the Festive Frame, as shown in this post. Crop it so there is 1/4" border all around it. I painted an unfinished wooden panel I got at Hobby Lobby (regularly 99 cents on sale for 30% off) using a foam brush and 2 coats of cranberry colored craft paint (these Plaid paints are 50 cents to a dollar). I adhered the stamped frame with mono multi, this works great on wood, but you could also decoupage it on with Mod Podge, you'll just have extra drying time. Drill a 5/8" hole through the exact center of the plaque, and then assemble your clock kit as shown on the packaging. Here I have it displayed on a bookshelf, propped up with an inexpensive brass display stand (they have these by the checkout at Hobby Lobby also, they are perfect for photographing your cards, too!). The clock kit ( 3/4" depth for the panel is $5.99 at Hobby Lobby (or 3.63 with their 40% off coupon!)) has a bracket on the back so you can hang it as well, below I have it on the wall. The oval on the frame could be oriented horizontally if you preferred and the clock would be just as easy to read, so consider the space where you want to put it. Fortunately, without numbers you can change your mind at any time (no pun intended!) and turn it if you wish, just reset the hands accordingly! With these colors and my decor, this is something I could have out year round. I made it for less than 5 dollars, and it would be an attractive and functional home or office gift for family, friends, teachers, etc. Hope you like this idea, have a great day! I've had lots of wonderful feedback as well requests for coloring the poinsettias in "Festive Frame": although I don't have a video, my process of just 4-5 steps for these is so simple, a few pictures ought to do! :) I don't use the Colorless blender very much when I'm coloring (for me it's mainly for taking away boo boos or just when I ended up putting on waaaay too much color than I should have), preferring to stick with just a few contrasting shades of each color for a lot of "pop". (Blend too much and you can lose the dramatic shadows that really make your images look 3D.) Today's will be using traditional colors. Color the poinsettias completely with a solid coat of R16 Strong Red (above). Imagine "the light" coming from "above", and trace along the undersides of each petal with R59 Cardinal where there is one overlapping another, just following the underside of the lines. Pick up Strong Red again and go over these areas you did with Cardinal, working in the same direction you made the Cardinal strokes. If more blending is desired, go over the lines/areas in small circles. You'll see how these darker lines blend seamlessly into the Strong Red layer. Color in the center with YG03 Yellow Green of other bright, light green. Add a few dots of Greenish Olive or other darker green to the middle and bottom of the center. That's it! you're done! Trace with a Stardust pen or add Stickles for shimmer if desired. Here are the remaining colors I used for the pine cones and needles. As you can see: I usually only use two shades of a color, and create the other shades i need "in between" by doing tip to tip coloring, (which is picking up the darker color on to the lighter marker and coloring with that, which I'll share this another time) )or as I did in this tutorial just using the lighter color as a blender going over the darker color. 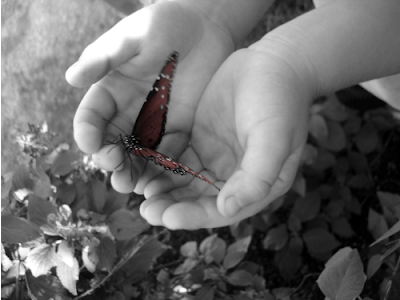 Stay tuned for a project I am SO excited about using this colored image!! :) Any guesses what I made this time?? You can see Linda added "2008" to the corner, I love this idea of creating a special card to send to a family using their holiday photo from last year! :) What a wonderful surprise to receive that memory of Christmas past... :) The "Festive Frame" is stamped onto pine patterned paper, and she cut out a full sized poinsettia from "A Year of Flowers" embellished with pearls and glitter to accent the bottom and a little Pure Luxury bow at the top to balance the layout. Beautiful photo project, Linda!! Linda's design details - embossed poinsettia onto Red Rocket that had been misted with Gold Glimmer Mist, paper pieced one poinsetta, used copic R59,R27, E33, black...matted onto stash dp, GKD white, red rocket, and all spruced up, gold mini pearls, gkd ribbon, 2008 from unknown collection peg stamps, nestie scalloped ovals. Here is a large 5" square card, with the only stamping being the greeting from "Festive Frame" on a popped up oval die cut. After I made this luscious double bow with my Bow Easy and some burgundy silk ribbon from Sharon's store, I wanted to keep the rest of the card, really simple, no image required!. The DP is Basic Grey Indian Summer, matted on Pure Luxury Cranberry Tart, perfect match with this ribbon. Base is Pure Luxury White, I embossed this little branch trim on the side, it's a bit hard to see in the pic but is a lovely match with the delicate pattern of the paper. I attached the bow with a glue dot, as well as a cranberry button to the bottom corner from the Autumn Assortment (it looks a bit dark in this pic, but matches both the paper and ribbon very nicely! Last I added an adhesive nailhead to button's middle middle for a bit of bling. I love how with a few top quality items, "simple" can be so "WOW!" WOW! This is beautiful. What an amazing idea! I love it! Welcome to our "First Christmas" Blog Hop! Today I used Asela's gingerbread pair to make a cookie wreath. I placed a circle die on my paper to use as a guide on my white CS and then stamped the image 5 times around it leaving a space at the bottom for my bow. After coloring, adding shadows with W-1 Warm Gray Copic and outlining the white piping with a Sakura Clear Glaze Pen, I cut loosely around the outline of the cookies. Next I took a small rectangle punch to make two slits in between each pair to thread my polka dotted ribbon through, I chose this one to go with the little white dots on the cookies. 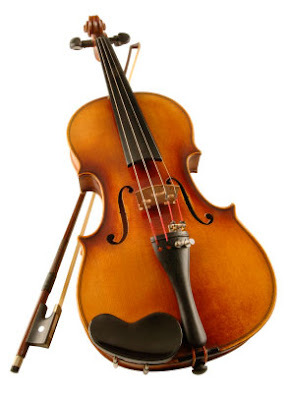 The bow is separate and attached with a glue dot. 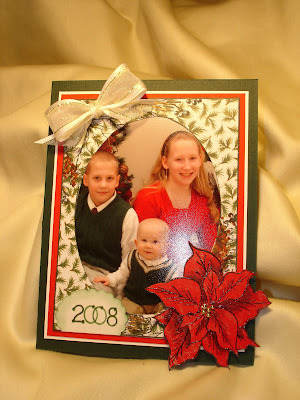 I stamped "Festive Frame" onto DP, this print has such a homey feel, and colored my borders in tan to match the cookies. Wreath is attached with pop dots, completely covering the oval border, and card base is Pure Luxury White. Are you ready for some more Eye-Candy tonight!? Stop in at Asela Hopkin's blog (our featured Illustrator tonight) and see what she has prepared for us. Remember, the Idea Center has lots of tutorials, photos, and links that will provide even more ideas for you with this stamp set! And, if you haven't already done so, be sure to leave a comment on GinaK's blog for a chance to win this stamp set tonight too! If you have already purchased this set, you may swap it out for any other GinaK stamp set valued at $23.95. I set out to make this primary colored card with the van or RV from "Are We There Yet?" to make my own color blocked Partridge Family inspired vehicle, but in the end just decided it would be easier to use the scooter LOL! I used a red, yellow and blue Copic for my "Inspiration Mosaic" grid, being sure to leave some white space to make the colors pop. The mulitcolored scooter is cut out and popped up. I added a greeting from the set to the grid, as well as a row of silver embossed dots from the "Inspiration Mosaic" set to go with the wheel theme and added a little silver to the handles and rims. I offset two blue mats at the top left and bottom right corners of the Rocket Red card base to give it even more of a funky, pop feel. Thanks for coming out to this special mid month release: Tami Mayberry's " Calendar Bit & Pieces" and "Calendar Grid" sets! The calendar grid is just that: an open grid with the days across the top for you to fill in as you please, the larger set includes all the months, numbers occasions, and little images to go with. I started out making an extra big CARD, measures 5 1/2" x 7 1/2", because I think it makes a fun background not just for calendars. :) The little "I love you" and "24 - 7" are all separate stamps included in the set , I just pieced them together on my block and then stamped the heart in Vivid Brick on every day of the month. A fun and easy Valentine! Cardstock is Pure Luxury White, Black Onyx, and the new Kraft, very excited about this new neutral! Last I added some adhesive nail heads to jazz it up as well as to go with the calendar theme, like it's a page waiting to be torn off to reveal the next. Gina will be showing an easy way to stamp the numbers into the spaces you need for the particular month, here I actually left all mine together, 1-31, as one stamp (no cutting) and just inked up everything to the right and below "1" and stamped into place, then cleaned my stamp and inked up the remaining rows to put on Sunday and Monday. Pretty simple! The Menorah and Christmas tree are also part of the set, it's fun to stamp these and the other holiday images over the proper days. The month "December" fits in the small oval punch, and I layered it with a large one colored with C-3 Copic, which I also used to color the borders on my frame. Last I made a perpetual calendar with all the numbers, plus some images, stamped on white and punched with a 1/2" circle then adhered to flat marbles with some Crystal Lacquer. I added a little strip of adhesive magnet tape to the back of each, now they are ready for the fridge, but not quite so strong that they want to stick through CS. the solution I came up with was to stamp the calendar in StazOn onto a clear envelope I had and cutting of the adhesive strip on the end. Now I have a clear pouch that I can slide a piece of patterned paper into corresponding with the month or season. Kids (and this big kid!) love perpetual calendars, it's always fun to be the one to get to set up the new month and change the days, adding in birthdays and holidays. My older son came in while I was making this so he set to work stamping out all the other images I hadn't already done, he's a little "magnet crazy" now! For some helpful tips on how to use the Calendar Bits & Pieces and Calendar Grid stamp sets, please be sure to check out Gina's blog and StampTV for a helpful video on just how quick and easy it can be to use! Both of these sets as well as the PDF version of the Calendar Grid image will be available for purchase tonight over on our online store. After that, stop by our Illustrator's blog - Tami Mayberry for some projects with her timely stamp sets. I chose to photograph it on our coffee table not only because it's extra long (but still folds up to A2 size!) , but it would be beautiful displayed on a bookshelf or here as a centerpiece, if you had a little more time you could also decorate the backside with four more frames showing Christmas memories. TIP: to cut down the time of this project, stamp the frame in color on white or emboss on colored CS and skip the coloring! This accordion is something I would be happy to make for myself for our family to enjoy every year, like a mini scrapbook so to speak. These are my two sons' school pics, along with greetings from the set, but with your printer or alphabet set you could add names, dates, stamped holiday images, or two more photos in the panels in between. 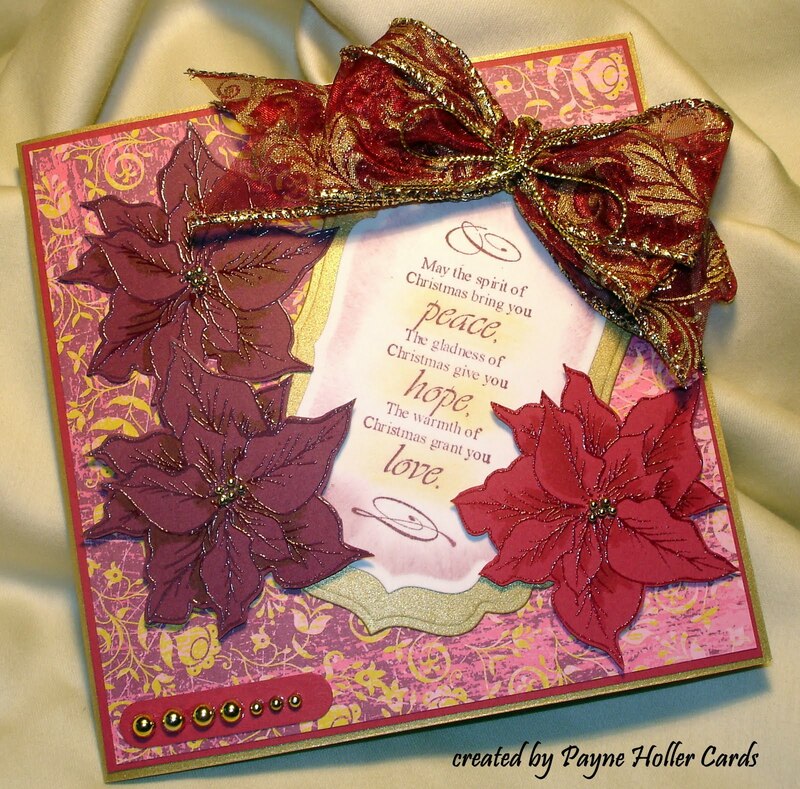 I added some Cranberry Tart Large Punched Flourishes and adhesive nail heads to the corners and flower centers. You can see in the closeup the sparkle on the images, I used the Sakura Galaxy Glitter Pens. I've long been a fan of their Stardust Pen, but just got these colored ones, and I am so pleased with the results! While they may not always be an exact match for your colors or cardstock, when you apply then tone on tone, like the golden pen over the Mignonette Copic in the flowers and lime pen over the Verdigris Copic above, or the rose pen on the Cardinal Copic below, they blend beautifully but the glitter still really pops! I did not use any additional papers to mat the frames, all the different "borders" you see are just the images colored with markers! My next projects use the waterproof labels Gina K sells. These HUGE 3 1/3"x4" labels are a steal at only 43 cents a project (you get 30 labels for 12.95!) You don't need special inks, all your stamping and coloring are preserved, even if it gets wet! If your packaging already has a label on it, you can soak it off in a few minutes with some water and then dry before applying your new one. On both of these I stamped the frame in Memento Tuxedo Black onto the labels (before applying them to the bottles LOL!) and colored them with Copics. Now I have beautiful, handstamped labels to dress up these gifts and don't need any additional papers, adhesives or embellishments (except maybe some ribbon, I'll get to that in a minute!). Here is a closeup of the wine label, I rubbed the Antique Linen Distressing Pad all over it to give it this beautiful yellowed patina, and then stamped the crackle image from Bold Flowers all over it in Tuscan Tan, perfect for an elegant and aged-looking wine label, isn't that gorgeous?? TIP: I stuck with just greetings from the "Festive Frame" set today, but try personalize the oval window by adding the date ("2009, a very good year! "), a monogram, your family's name, etc! As you can see, the label is slightly smaller than the stamp image, but you do get the window in its entirety and corners clusters, the only thing that's missing is the outside frame...still looks like it was made for it! I found this large vanilla jar candle at HEB, they had an assortment of holiday scents for only $3.98 each, but you can find similar ones just about anywhere. After stamping and coloring the image, I colored the oval with Lionet Gold Copic and stamped the music score from Nina's Vintage Borders in Antique Linen Distressing Ink over the whole label. I also rubbed a little of the gold Metallic Rub On Paste over the corners. This time I mounted the label horizontally to fit the jar. The gold lined organdy white ribbon is from Gina K Designs, and I made both of the bows you see in this post with the Bow Easy. Jar candles like these make perfect gifts for friends or teachers, with their extra long burn time they can enjoyed over and over and the label outside will look just as pretty once the candle is gone. BONUS gift: The remaining wax inside can be popped out and the clean jar repurposed for holding candy etc! I hope these labels inspire you to explore the many gift giving possibilities for these Festive Frame labels, they would be just as perfect on a tin of cocoa, jar of bath salts, or store bought or homemade preserves, and as I mentioned before, with an alphabet set you could add "Mom's Jelly", "Snowman Soup" etc to the frame! After you're done hopping to all the Designer's blogs stop by GinaK's Idea Center here: Festive Frame for lots more ideas on how to use the Festive Frame stamp set. And, don't forget to check in on GinaK's blog so you can leave your comment to be entered as a chance to win this stamp set, too!